I literally can’t wait to pop up at the creative and highly personable La Di Da Interiors early this summer at an exclusive event ‘down South’ where I will demonstrate some of my favourite techniques and secrets to my signature style. I was delighted to meet Steph, the owner of La Di Da when she joined me on a residential workshop in Lincolnshire last year. 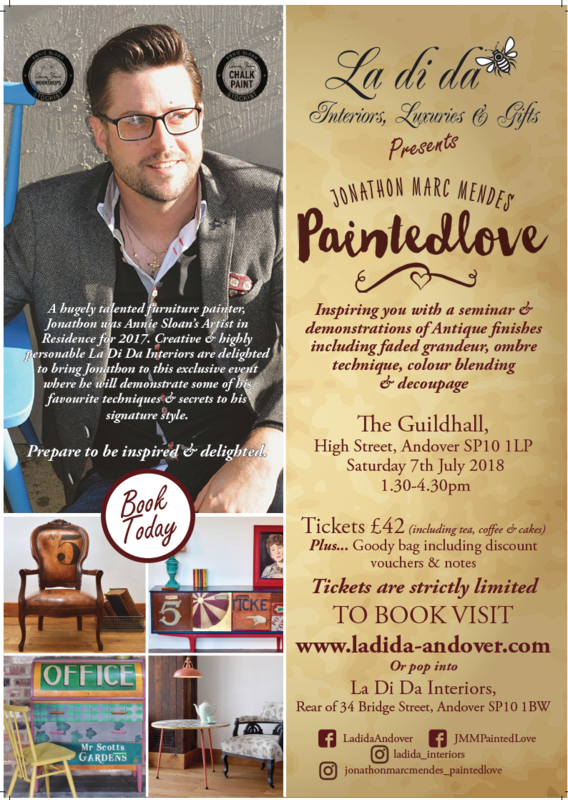 She is a hugely talented furniture painter herself so it’s an honour to co-host a demo event with her and share what I learned as Annie Sloan’s Artist in Residence for 2017. Read about it here on Steph’s blog as you prepare to be inspired and delighted. What’s included? A seat for the demonstrations, lots of tea, coffee and cakes and a goody bag to take away including notes and vouchers (from me and from Steph so there’s heaps of extras to look forward to. There will also be a Q&A session so you can ask me whatever you want to improve your own painting. Whether you are a paint professional or an absolute beginner, I would be delighted and honoured to meet you. I have traveled so extensively overseas teaching and demonstrating over the last two years it will be fabulous to be back in the UK sharing a few hints and tips with you all. Buy tickets here directly from Steph at La Di Da. They will be posted and required for entry on the day. Simply pop over to my Events page for full details of this year’s itinerary. If you’d like to discuss a booking, please contact me here. Previous Post Etsy – here we come!